This blog seems to have a life all it's own. 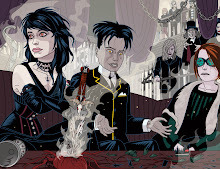 It's a living, breathing creation powered by the people who so graciously leave comments and send me scans of rare material germane to the topics discussed and analyzed on its pages. With yours truly as the old blogmeister, fussing around the guests with a tray of cybernetic tea and cakes to help sustain the proceedings, secure in the knowledge that the event has a life all it's own and all I need to do is refill the odd tea cup and generally make sure everybody has has everything they need to sustain the discourse. Take Phil Rushton's recent remark hinting at a reader's contest where a Ron Embleton original oil painting was offered as a prize. Phil couldn't remember the details and neither could I for that matter, but David Slinn, who was actually working as an artist in the comics industry at the time and is one of the contributors to the Wulf the Briton book came through with more information and some scans. So here's the painting and it's none other than UK thespy David McCullum as heart throb Illya Kuryakin, from the Man From Uncle. 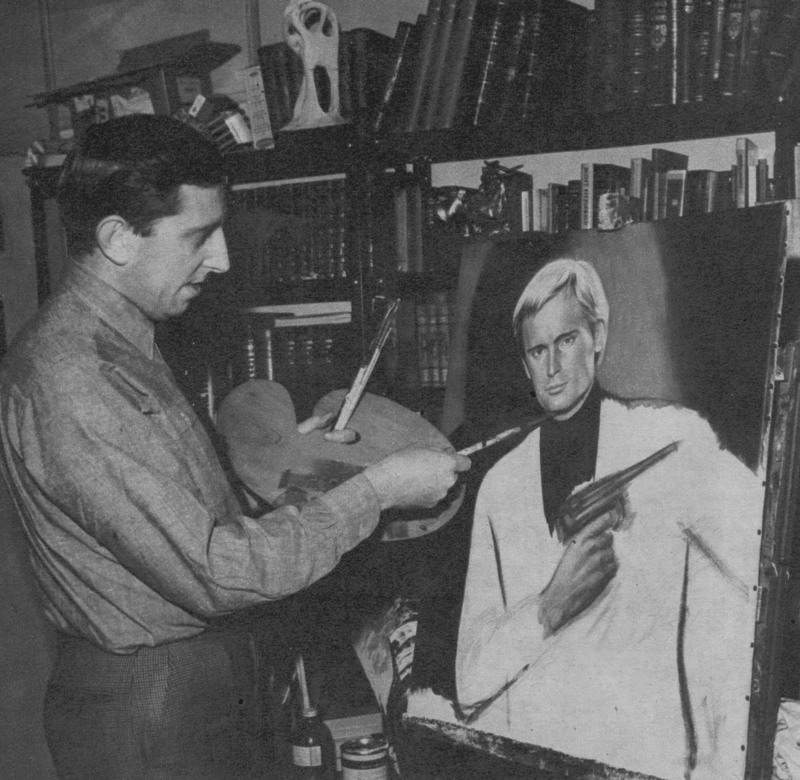 And here's a photo of Ron Embleton painting the picture where you can see how he is building up the form. 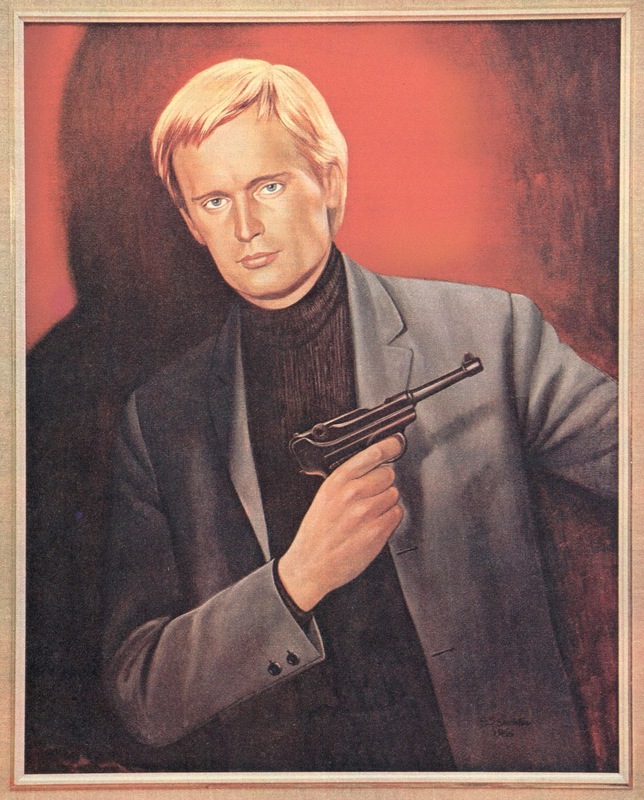 Notice also that Ron has given Illya a Luger rather than the ridiculous hand gun come cocktail dispenser that some TV exec thought was the cutting edge of cool in 1966. 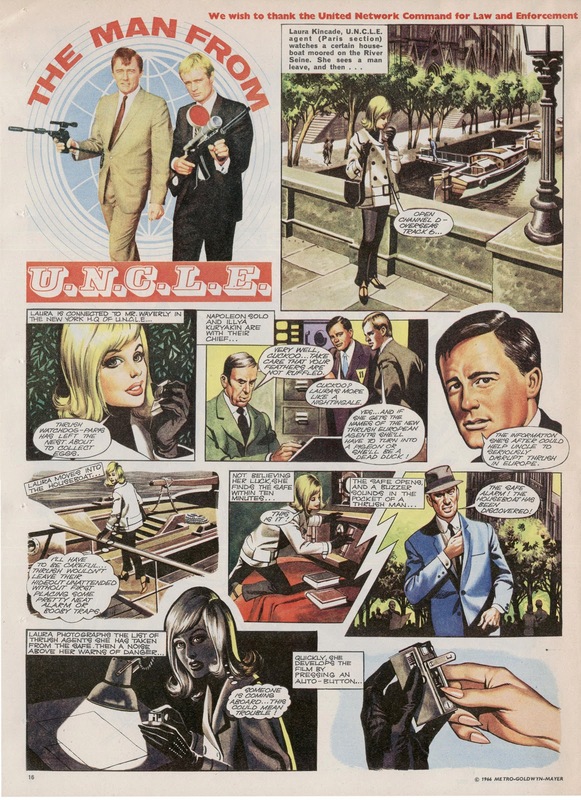 The competition would have (I guess) ran in TV21's sister comic Lady Penelope, which is where the Man from Uncle strip appeared. Lovely artwork again by Ron Embleton although the action on the girl administering the karate chop to the baddie is a bit preposterous - but then so was The Man From Uncle. EFF ... AAYYY ... BEEEEE!!! Superthunderstingcar - marvellous. Thank goodness the Beeb didn't wipe that along with Power of the Daleks. I shall have a look in the attic for my old TV21s to see if I can throw any more light on the competition. It is is curious that they appear to have got the rights to use exact likenesses of Leo G Carroll & co, which I believe can be quite expensive - hence the odd Star Trek comics of the 1970s, wherein only Kirk, Spock and McCoy even vaguely resembled the original actors. ...And yet Harry Lindfield seemed to have no problem with using photographic likenesses of the entire crew when the British version of Trek appeared in Joe 90: Top Secret - a tradition that was continued on the covers of TV21 by the wonderful Mike Noble (and even, on one memorable occasion, by Frank Bellamy in Radio Times - a single page that led to him being described in America as "the British Star Trek artist"!). By contrast I never understood the Byzantine legal thinking which lay behind the version of 'Lost in Space' appearing in Lady Penelope being based on the US Space Family Robinson comic book instead of the very different TV series that most readers must have associated the name with. It might have made sense as a cost-saving excuse to reprint American strips, but in the event all the material was brand new, with artwork by John Burns! Err... that's not a karate chop, that's a 'clip round the ear' - an ancient technique still used by wimin for disciplining hapless males everywhere (although in LA they use other methods...)! 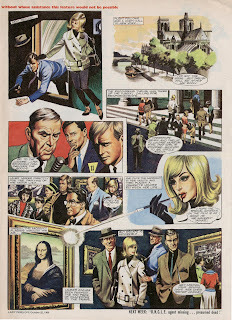 And, finally, a full-page reproduction of the painting from Lady Penelope 016, 07-May-66. Many thanks Michael- excellent and very illuminating!